Former Jaguars tight end Pete Mitchell joined “XL Primetime” on 1010XL to discuss his thoughts on the team’s new starting quarterback, Nick Foles. 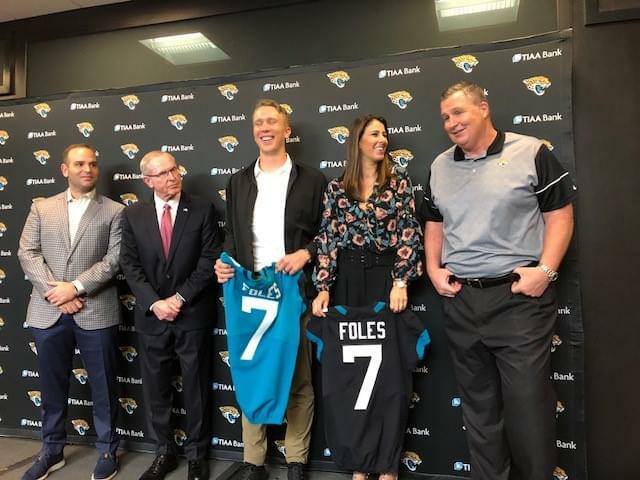 “We had a lot of great players back in the day, but we also had that quarterback and it’s even more magnified now because the teams that are winning are the ones with that franchise quarterback,” Mitchell told 1010XL. “So, it will all start with Nick Foles. Mitchell not only played for Tom Coughlin in the NFL with the Jaguars, but also in college at Boston College. He discussed Coughlin the college coach vs. Coughlin the NFL coach. “There was not a lot of difference other than off the field stuff,” Mitchell said. “Tom was as tough as there is, especially back in college. He came in after my true freshman year and that first spring we had was probably the toughest three months of my life. Playing the tight end position in today’s NFL is certainly a little easier than when Mitchell was doing it here in Jacksonville in the mid-to-late 90’s. Rules are now more beneficial to the offense and Mitchell was asked if he ever thinks what his career might have been if he played in today’s game. “You’re going to get me angry,” Mitchell said laughing. “I think about it all the time. I remember playing against guys like Levon Kirkland, where I would try to run a 10-yard route and the guys would be wrestling with me the entire way. Finally, Mitchell was asked what the biggest differences were in the Jaguars in his opinion from 2017 to 2018 and how the team can return to its AFC Championship Game form of 2017. “From the outside looking in last year, it seemed like the defense didn’t play with the edge that they had before,” Mitchell said. “I also think you need a true leader at the quarterback and I really hoped Blake (Bortles) would have been that guy, but unfortunately it didn’t work out. “I am excited to see what Nick brings this year. I really think that was the missing element to them. “I really wasn’t surprised that the first year Tom came in that he made a big difference. Wherever he goes, Boston College, the Giants, Jacksonville, wherever he goes he has won, so you have to have faith and trust in him.